DESCRIPTION: Delightful home situated on a quiet side street offering plenty of sun and open spaces. 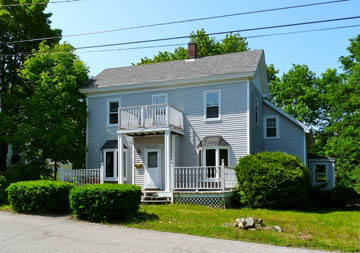 Walking distance to all that Bar Harbor has to offer - dining, shopping and the free Island Explorer bus. LAYOUT: FIRST LEVEL: Covered porch. Spacious living room with new furnishings ('11), Kitchen with side counter and seating for 4. Dining room with seating for 6 - 8 people. 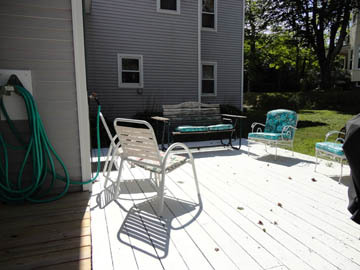 Access to outside deck. Bedroom with a bunk bed and sliding doors to a back deck. Full bath. Laundry area. SECOND LEVEL: Master bedroom with small tv, king bed and small balcony. Bedroom with twin beds that can be pushed together for a king). 3/4 bath with shower only. WINTER RENTAL: Disclaimer: Lessor only to rent to a working professional. Sorry, no college students. $1100 per month <includes water/sewer/garbage/phone/internet & basic satellite> tenant to pay all other utilities <Propane heat, electric, phone and snow removal>.